Wild Coyote Estate Winery & Vineyard's adobe-style tasting room is a blend of Mother Earth, Native American cultures, grapes, and wine. Owner and winemaker Gianni Manucci's eclectic Southwestern art collection and an authentic, life-size tepee make wine tasting at Wild Coyote a memorable experience. Situated 1,800 feet above sea level seven miles west of Paso Robles, Wild Coyote evokes Gianni's long-standing interest in pueblo architecture and the culture of Native Americans. A former architect, Gianni has made numerous trips to the Southwest since the 1970s to study tribal customs, artwork, and building styles. In 1995, Gianni changed careers, becoming a grape grower and winemaker like his grandfather. He purchased a 40-acre dry-orchard farm on Adelaida Road and two years later planted a vineyard with Syrah, Merlot, and Zinfandel grapes. The name "Wild Coyote" is a reference to the same pack of coyotes that roamed the property before the vineyard was planted. 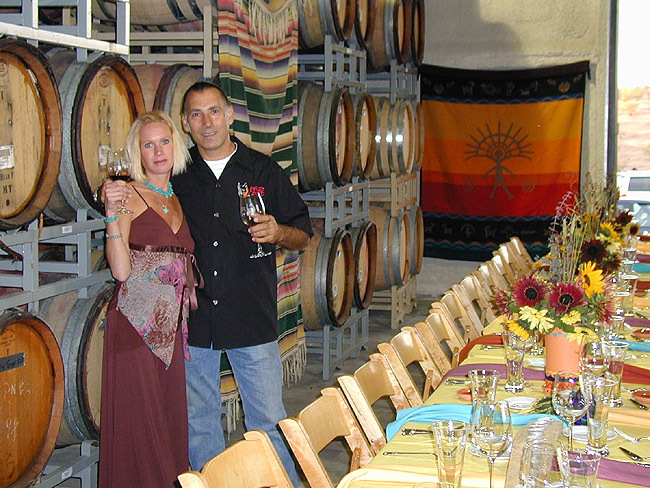 Gianni designed and constructed the winery's Taos-style tasting room in 2002, using the numerous sketches and notes he'd made during his travels in New Mexico. 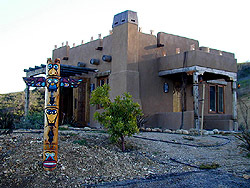 "The tasting room was a challenge to construct and required many trips to Taos to bring back building materials I couldn't find on the Central Coast," Gianni admits. "I wanted to create an atmosphere where people could come and take up some of the energy and mysticism of Native American culture." 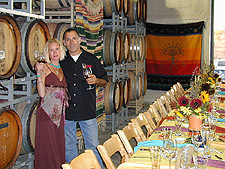 In 2005, he built adjacent to the tasting room a five-bedroom, Casitas-style bed and breakfast. Since its first releases, Wild Coyote has received critical acclaim. Its 1999 Syrah received a rating of 92 points from Wine & Spirits magazine, a gold medal at the 2001 San Francisco International Wine Competition, and a silver and a bronze at the 2001 Orange County Fair Wine Competition. Although Gianni has enjoyed success as an architect and a winemaker, he claims he is "really an artist in spirit." A prolific stone sculptor, Gianni displays many of his pieces in the tasting-room gallery, including statuary depicting the Weeping Buddha, a bust of the Spiritual Chief, and, of course, a wild coyote.